Allen Dulles was the 5th Director of the Central Intellegence Agency (C.I.A.). He is noted as the first civilian to ever hold the post, and to have been the director longer than anyone else. During his tenure, he oversaw projects such as the U2 spy plane, coups in Guatamala and Iran, and the failed Bay of Pigs invasion of Cuba. Following the assassination of President John F. Kennedy, Allen Dulles served as a member of the Warren Commission which concluded that assassin Lee Harvey Oswald acted alone. 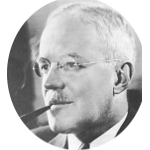 Allen Dulles belonged to one of the United States's most politically connected families that included his brother John Foster Dulles (52nd U.S. Secretary of State) and grandfather John W. Foster (32nd U.S. Secretary of State). His presidential connections include William Howard Taft, Ulysses S. Grant, Franklin Pierce, Zachary Taylor, Calvin Coolidge, Franklin D. Roosevelt, and a number of others. Allen Dulles is a direct descendant of Mayflower passenger William Brewster and has a kinship to fellow passenger Edward Winslow. He also has royal connections to the current royal family through both Princess Diana and Queen Elizabeth II, and he is a direct descendant of King Edward I. Celebrity kin to Allen Dulles include, but is not limited to, actors Clint Eastwood, Bing Crosby, Shirley Temple, Jane Fonda, Ted Danson, Sigourney Weaver, Raquel Welch, and John Wayne.